My heart receives so much joy from the notes and stories you all send to me. The healings, the connections, the power of connecting heart to heart are so beautiful. Keep on telling me your loving fur folk stories, thanks for telling me and touching my heart by your words! 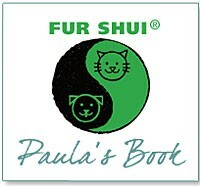 “Our whole family–including the furry ones—highly recommend Paula. She did readings on 2 of our elderly pets and the information helped us know that we were doing the right thing for them. With our cat Karen who had lymphoma, she was able to tell us that Karen was saying goodbye and that the treatments weren’t working. We were then able to focus all our attention on simply loving her for her last days. 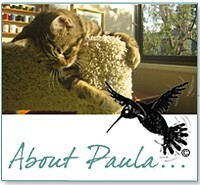 “We were very lucky to have been referred to Paula. We lost our wonderful dog, Rollie, who happened to be our soul mate. She was able to communicate with him and let us know that all was well in his new world. This was and is very comforting to us. Our lives then became enriched with the addition of a beautiful mare, Ama Ray, to our family. We had some important decisions to make regarding her future. Paula was able to give us some feedback from Ama. We followed our hearts and let Ama travel to a beautiful farm in California – she will soon be a wonderful Mother to a very special foal who will be born in February of 2007 – she is so happy in her spacious grassy pasture with her new found herd I’m not sure we will ever be able to get her to leave. Our heartfelt thanks to Paula for facilitating this communication. “It was magical to hear Chloe-Zoe’s thoughts in her own “words”, her unique viewpoint. The information was quite valuable, but the communication itself was beyond price. A lot of confusion was cleared up, thanks to Paula, and our family lived together more peacefully. And I was a much better “mommy” to our two cats. And when one of them passed on, he got a message back to me through Paula that was very, very comforting. “I have been working with Paula for many years now. 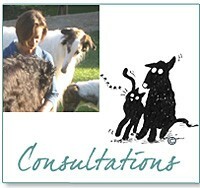 She has helped me with my large family of animals which consist of three dogs and two horses. We started with just one of each and having Paula made the transition of adding some rescues to our group easier. Most recently she helped me to make that final decision of helping a dearly loved 13 year old chocolate lab move to the other side to be my personal angel! He had been an incredible companion for my children, a wise dog who helped the other rescues feel settled and safe in their new home and a personal guide for me. He embodied the idea of quiet strength and unwavering loyalty. He helped me use my discernment to know what true love and friendship felt and looked like and to not accept anything less from anyone not even my family or people who said they were my friend. It was hard to let him go but also a relief to be of help to him. He had done his job not only on the physical level but also on the spiritual. I will be forever grateful for our time together and know he still is with me. Best of all I got to see an angel being born and flying home. Situation: “Lucy” the horse became extremely sick, and even the highly skilled vets couldn’t figure out what was wrong with her. She was so sick, they didn’t know how she could still be alive and they suggested that her person bring someone in to assist in giving Lucy’s illness a name. After I talked with Lucy and helped her energetically, I was able to help identify her physical and emotional conditions. Everything Lucy told us assisted her person in dealing with Lucy’s condition and making Lucy more comfortable. Three months later, Lucy was found to have Equine Grass Sickness, a rare European disease. The symptoms of the disease and the way Lucy initially described how she felt matched up perfectly, and shortly thereafter, Lucy started to regain her health. Not long after that, I helped Lucy and her very pregnant stable mate, Samantha, complete a cross-country move from California to Michigan. While on the road, this required twice daily conversations with the two in order to monitor their well-being. Both arrived safely after re-scheduling rests and rigging needs based on communications from both animals. Lucy showed her love and zest for life for two more years until her passing in late 2005 and is still with Kimberlee in spirit helping her with her new farm and horse family. At present, Samantha her foal Journey and new foal Tobin, are enjoying their life in Michigan. Situation: Person wishing to know if it was the right time to bring home a new companion dog for their surviving dog after the death of its previous canine companion. I spoke with both animals–the one that had passed and the surviving dog. Using the read, the family was able to choose another compatible dog to add to their family! “Paula couldn’t have possibly known about most of the move activities and information she gave me, but she was right on the mark. Cassie did wonderfully on the move from Jacksonville to Phoenix. Even before the flight, she didn’t panic like she normally would. And after she arrived, she was fairly calm. I thought Paula did a fantastic job and I greatly appreciate all she has done for me and Cassie. Situation: “Rasta” the cat was in intensive care with acute pancreatitis. I spoke with him daily and performed energy work after each conversation. A very strong love bond between Rasta and his person developed that helped enable his healing. Once home, he fell ill again. Both energetic and telepathic reads helped reveal a dangerous, new condition. The owner convinced the vet to do an abdominal scan, which uncovered irritable bowel syndrome. Now on a restricted diet, Rasta is happy and living at home with his brother and family.